Fresh off the heels of an outstanding week for financial markets that set several record highs for stocks, investors ducked behind the bushes last week at the first sign of danger. The S&P 500 finished last week 0.9 percent lower, its worst week since April, as fears spread as a result of instability within the Portugal banking system, and as the Israel-Palestine military conflict found fresh legs. With corporate earnings season right around the bend, investors are likely to key in on results from the second quarter of 2014, while also looking for confirmation that corporate managers are optimistic that the economy will continue to strengthen throughout the remainder of the year. A considerable period of time has passed since European Central Bank leader coined the phrase, “whatever it takes,” as he responded to what the global bank stood ready to do as fears of default on government bonds in several European countries spooked investors around the world. Since the peak of the scare in 2012, sovereign bond yields across the European continent have plummeted from astronomic highs, to lows that rival yields in some of the largest, and perceivably most stable countries in the world, such as the United States. This past week, however, Portugal was in the news as a company linked to Espirito Santo, the nation’s second largest financial institution, had missed debt payments. 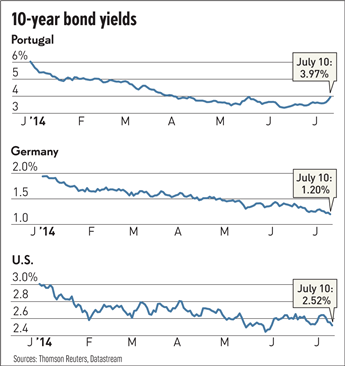 While the fragility of the European economy is a serious concern, it’s worth noting that bond yields in Portugal, and other countries, remain only a fraction of where they stood in 2012, and are still considerably lower than where they began the year. This tells us that investors, even after being spooked last week, remain far less concerned that any type of colossal failure of the financial system is imminent. We’re in the early innings of the quarterly corporate earnings reporting season, but once again, the hurdle for stocks remains rather low. Expectations vary by source, but most predict that earnings per share of S&P 500 companies, on average, will have grown by about a 5 percent annualized rate in the second quarter of 2014. Revenue growth expectations are even lower. Investors will likely be paying close attention to management comments on upcoming quarters, as we put the atrocious weather endured during the first quarter further in the past. 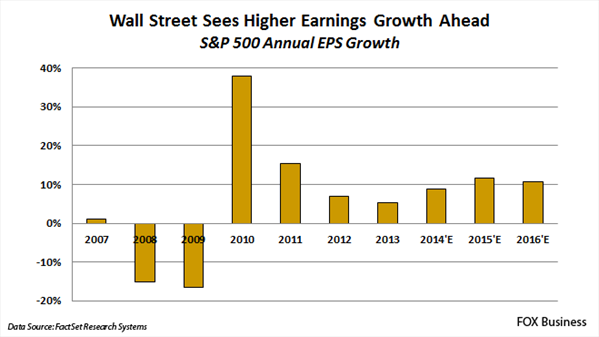 Current expectations, according to FactSet, are for earnings to accelerate significantly to 9.4 percent in the third quarter, and 10.5 percent in the fourth quarter. Given where stock valuations currently stand, it’s likely that any further gains in the stock market will prove to be increasingly difficult without this presumed acceleration of earnings coming to fruition. Warren Buffett, a man who’s made his fortune by actively identifying and purchasing stocks, raised a few eyebrows earlier this year after he recommended that most investors should simply buy a low-cost exchange traded fund (ETF) that mirrors the performance of the S&P 500 rather than paying someone to manage their assets. He claims that in today’s world, it’s too difficult to beat a fixed index of securities. However, one thing most people may not realize is that the S&P 500 itself is a quasi-actively managed fund. 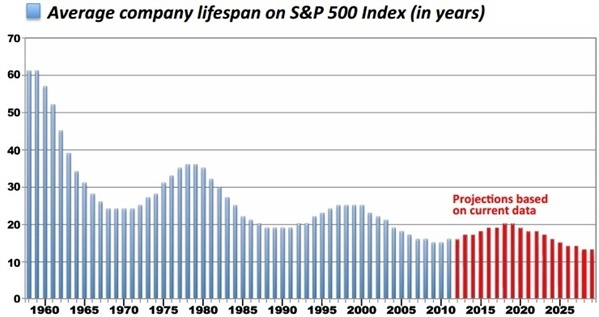 The average company’s lifespan in the S&P 500 index used to be well above 50 years, but has shrank all the way to a mere 15 years today. In other words, should trends and estimates hold true, more than 75 percent of all companies currently in the S&P 500 will have been replaced by 2027, according to Forbes. Furthermore, you never get to meet the people dictating the turnover in the S&P 500 index.